You’ve got to love the season of perfect conditions. Autumn means more Goldilocks running weather – not too warm, not too cool, just right. Between the vibrant foliage and the abundance of other runners out training for fall events, there’s plenty to take in. and you’ll likely run faster than you have in a few months, since runners tend to slow by 20 60 30 seconds per mile with every five-degree increase above 60F. Here’s how to make the most of the season. To spend more time enjoying the pleasant weather and changing leaves, lengthen your long runs (which you should be doing every other week). Run about three minutes per mile slower than 5-K pace and increase total distance each time by between a half-mile and a mile. Take a 20- to 30-second walk break every minute from the beginning to avoid fatigue. Because there are more motivational challenges in winter, it’s smart to sample running groups now. Find one with runners whose company you enjoy, and you’ll want to keep meeting up with them after the seasons change. But before trying a new group, find out if there are runners who go at your pace. October brings Halloween, and with it, consumed races. These events offer a chance to have more fun on race day – it’s hard to be nervous when dressed up. Avoid costumes that restrict your vision, take up lots of space, or cause you to overheat. 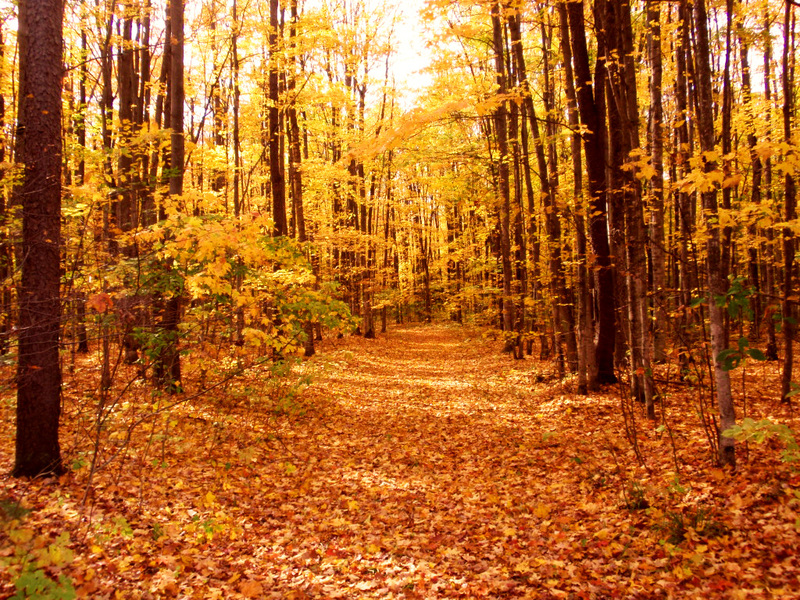 Foliage fans will love a tree-lined trail, and the soft surfaces can be a nice change of pace for road runners. If you check out a trial, take care: Fallen leaves can hide holes, roots, rocks, and – gasp! – snakes, so approach covered sections with caution. My favorite park hosts races almost every weekend during the fall. Is it okay to run there while an event is taking place? Generally, yes, unless there are barriers keeping nonregistered runners off the course. Avoid the starting and finish areas. Yield to runners wearing bib numbers. And finally, consider running against traffic –t hat way, no one will think you’re racing without paying for it. I started running this summer. Now that it’s getting chilly, what should I wear? Start with a long-sleeve T and running capris or pants made of swat-wicking technical material. (Cotton clothing will absorb sweat and make you feel cold). Wear light gloves when temperatures drop below 50 degrees. Technical Trails – “Technical” means that a trail is rocky, rooty, narrow, and generally obstacle-laden. Runners who are new to trails should steer clear of technical terrain. Instead, look for rail trails, which tend to be flat, straight, and smooth. This entry was posted in Running Tips and tagged Fall Running.